Are there differences between live video and pre-recorded videos when it comes to purpose and reach? We chat all about the things you should consider before you decide. A lot of the time, we look to live videos as almost a bit of a fallback plan, because they are easier to produce than the pre-recorded videos. So today I wanted to share some strategies on how you can leverage one or the other in your business and also, some really key, important things that live video has been able to teach me that pre-recorded videos have NOT. With pre-recorded videos and live videos, they each have their own place and time that makes one or the other a bit more suitable. And how do you know this? I feel like, myself included, a lot of the time, we just say, you know what? I’m gonna go stream live because it’s a whole lot easier than setting up my light kids and audio and having to edit the videos… so in some ways, live video has become a fallback because it’s so much easier. But I don’t see a lot of people using live videos and pre-recorded videos as a STRATEGY that you can use together! I wanted to share some ideas so that you can start to implement these things so you have a really clear understanding of what it is that makes live videos really great and what you can do with pre-recorded videos that you might not be able to do with live videos. One of the KEY main differences is that pre-recorded videos are great for presenting ideas. So, if I ever have to do things like a blog video or a sales page video – anytime I know that I’m going to have to sit down and present very specific information that I don’t want to get lost or don’t want to ramble over, I’ll take the time to script that out and I’ll do that as a pre-recorded video. You definitely want your sales videos to be a bit more polished and presentable, so pre-recording is the best way to go. The cool thing is that live videos are made for engagement. And yes, pre-recorded videos are great for building that know, like, and trust factor with your audience; they can consume your content even before you make that connection. But with live videos, it’s still kind of blows me away – we’ve never really had this technology before now. My background is in the film industry and I worked with cameras long before high definition was even a thing. So back in the day, when we wanted to stream live broadcasts, which were limited to things like the Olympics and sports events, we used to have to have these giant decks that were bigger than me that required two men to carry, plus all these live-switcher cameras in order to stream this event. Now, we have all this technology that we can bust out of our back pocket so that we’re able to connect with people on the other side of the world. Super, super cool, right? Live videos are made for engagement. You don’t want to go on live and spew content. You want to take time to say hello, tell me you’re here, and ask questions. That’s going to be really important. One of the things live video did for me was make me speak clearer. Yeah, live videos can look super polished… but live videos will make you practice speaking on the fly. If you have any resistance to speaking on video or feeling like you tend to ramble, or maybe you’re the opposite and you think you don’t have anything to say and you freeze up, you’re not alone! The first few videos, I wondered if I should delete them. They were terrible! But they were just so valuable for teaching me. And I think as adults, we tend to fear things a lot more than children do. If you were to think about being a toddler and learning how to walk and how many times we fell down before we learned to walk, we’d never want to think about facing something like that as an adult! When we’re put on the spot, we tend to really do everything we can to fight it. My best advice to you is to know that it IS a process, and that’s totally okay. It’ll get a lot easier. So I want to talk a little bit about algorithms for a second, because we know that each individual platform will always have its preferences. And Facebook, while it might like pre-recorded videos better than images or text, LOVES live video. What does that mean? It means Facebook is kind of watching your videos – which is a little creepy, but that’s kind of what they’re doing. They’re listening in on whether or not you’re getting the likes, the comments, the interaction and engagement during that live stream. If you are, then Facebook says, yes, this is great social content and I’m actually going to push it out to more viewers because this is share-worthy! So that’s one thing that is going to be really important as you do your live streams. PRO TIP: Next time you do a live stream, make sure to say, “Hey, if you’re joining me live say hello so that I know you’re here!” This will help your engagement and Facebook’s algorithm to kick in and push your video up higher. Be sure to ask questions so you’re getting comments! There’s a technique I see a lot of high level YouTube players using, and maybe you’ve seen this too, and I want to talk about it. The point of videos is to build the know, like, and trust factor with your audience and potential customers and clients, but it’s really important that your live streams stand as a roadmap to a call to action – to another place for them to go – at the end of your video. That being said, if you were just doing a live video and your call to action is, “Go grab my lead magnet” – that’s fine and dandy, but not all people are going to go and then click, and then download that lead magnet. So what some people have done is use these shorter social videos on Facebook that actually leads them to their main platform. So whether that’s YouTube, or a YouTube video that’s embedded on your website (and I think a website is always a great place to guide your traffic), but what they’ll do is have a longer, pre-recorded video. For example, it’s a blog video with how-to content, then after that, we’re going to take a snippet of that video and post it on Facebook to get people to go to that original video. Alternatively, what you can do is go on Facebook live and talk about that video a bit more, then, direct that traffic to your main platform. The important thing is that you’re not just ending the view right there on Facebook. Facebook is a great way to build those views, but you don’t want that relationship or view to end there. You want them to take action afterwards! And ideally, you want to send them to your website, because that’s where they can find out more information about you, they might want to download your lead magnet, etc. It’s a great way for them to dive deep and learn more about you! Now, I don’t want you to feel like you have to go nuts with the content-creation. You don’t have to create a video for YouTube, then a video for Facebook, and all that – but what’s really important that a lot of people miss is that once they create the video, your work is only half done! Now you’ve got this wonderful piece of content that you need to continuously share. Because the truth of the matter is you’re going to usually get way more replay viewers than you will live video watchers tuning in. And that’s a totally natural thing. It’s the way videos and Facebook goes. What you’ll want to do is always talk more about that content – talk more about that other video you created. 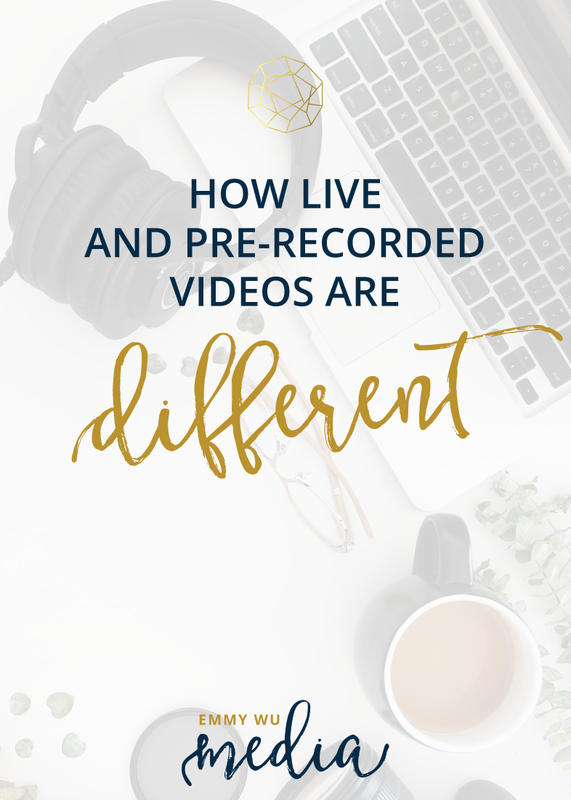 You could create five different live videos, all on the same topic of that pre-recorded video, but coming at it from a slightly different angle, right? So I hope that makes sense to you. The thing that I want you to really take to heart and the ONE key takeaway from all of this is that live videos are social. They are made for engagement. And even YouTube – it’s owned by Google. It’s a different treatment of videos. If somebody looks up how to make videos, YouTube and Google content is gonna come up. Whereas with Facebook, it’s really about how much engagement you get during the live streams that is going to help you get more views and replays. So think about it that way and the key most important thing is that you’re engaging with people! I’m a natural train wreck, socially speaking. A total introvert by nature and nurture. I also tend to use Zoom more than FB Live, is that allowed? I prefer Zoom because I can avoid my so-called “friends and family” who populate my FB list who tend to condemn and belittle me by giving me more grief about everything I do about how I speak, what I write, and everything else I do. I don’t bother to ask for people to comment and share videos. I would love to do CTA’s with videos with my website but I’m not able to post videos on my website yet as I’m still on the free version of WordPress. Hey Carri! Thanks for stopping by! While there’s nothing wrong with using zoom, you won’t be able to grow your visibility because only invited people can actually view your content. If you don’t have a website yet, you can start by growing content on your Facebook business page. That can act as your temporary “website” on Facebook to at least be able to attract customers and clients. Is it ok/technically viable to use my phone to make a video? Hey Saje! Absolutely! If you’re making a pre-recorded video (vs live), just make sure to use the back HD camera and not the front selfie camera which is a much lower resolution. It’s full high def, and more than enough for web sharing!